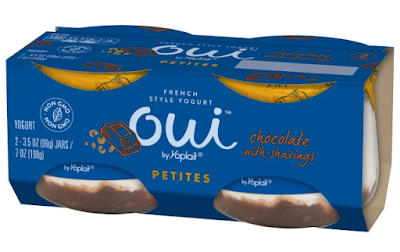 Yoplait expands their Oui "French-style" yogurt line with new, smaller-sized "Petites." Oui Petites come in pairs of two 3.5-oz glass jar (compared to regular Oui, which is sold in individual 5.0-oz glass jars). Additionally, the flavors are more indulgent than the regular Oui line and includes: Sea Salt Caramel, Chocolate with Shavings, Dark Chocolate Raspberry, and Caramelized Apple at launch. The idea behind the smaller, more indulgent line seems to be to encourage snacking throughout the day rather than just for breakfast. The Oui line has been fairly successful for Yoplait, garnering over $100 million in sales over its first year. You can find Oui Petites at major grocery stores and retailers nationwide starting this month. The suggested price per two-pack is $2.39 (may vary).